This is a live recording by a trio comprising of American drummer / multi-instrumentalist Calvin WestonFind albums by this artist and two Polish musicians: bassist / guitarist Krzysztof MajchrzakFind albums by this artist and violinist Henryk GembalskiFind albums by this artist. The album presents eight original pieces, all spontaneously improvised by the trio and co-credited to them. The music is an amalgam of influences but basically comes down to Avant-Garde Jazz-Rock Fusion, which although improvised has a clear melodic backbone, which serves as the underlying element for the extended improvisations. The unusual instrumental lineup creates a very effective ambience and the use of violin brings fond memories of early Fusion ensembles that featured the violin, like Flock, Hands and others. 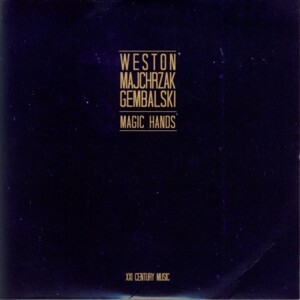 Gembalski, one of the most underappreciated Polish Jazz figures, clearly proves that he is as good as any of his contemporaries, but his association with the Polish Avant-Garde prevented his recognition in the mainstream Jazz circles, which is a great pity. Majchrzak drives the trio with his full bodied bass lines, which provide the continuity needed to avoid total mayhem. He is a perfect link between the stratospheric violin parts and the down to earth rhythmic layer provided by the drums. Weston, a veteran improviser who played with some of the most important American Jazz innovators, turns out to be a gifted trumpeter as well, and his tribal drumming is exactly what this music needs. Overall this is a very interesting musical adventure, different stylistically and aesthetically from the usual Fusion outings, full of excellent solo parts and superb cooperation between the participating musicians, especially in view of the fact that the music was improvised live. For connoisseurs of the violin in Jazz / Fusion, this is a revelation.